Welcome to the PM World Journal (PMWJ), the world’s newest online source of program and project management (P/PM) knowledge, news and information. 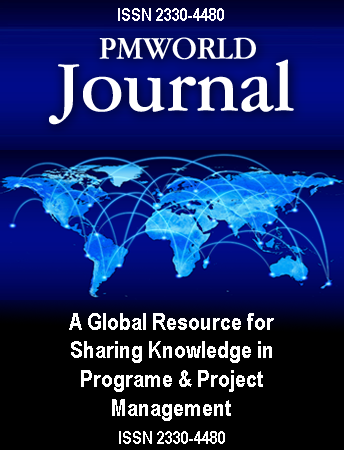 PMWJ is a non-refereed eJournal; our primary purpose is two-fold, to support continuous learning and knowledge sharing related to modern, professional P/PM. The PMWJ contains interesting, educational and useful P/PM information. It is also a service to authors, professional leaders, experts and practitioners who want to share their experience and knowledge, get published or gain more visibility. The PMWJ is a global resource; our authors and readers are located around the world. We welcome all views and perspectives. Hopefully the contents of the PMWJ will be educational or useful to you. Whether you are new to professional P/PM, or experienced in the field, there is always more to learn. The PMWJ offers educational articles, papers and other works to help you learn more faster. Offered by experienced experts, educators, consultants, executives and project management practitioners, the contents of the PMWJ provide educational and useful information. Some articles contain very basic P/PM information, others are more advanced. Whatever your level of experience or knowledge, we hope you find some educational content among the pages. With the wide range of programs and projects in industries and locations around the world today, and with such a wide variety of conditions and environments, it is impossible to learn all there is to know about P/PM from experience alone. In addition, because most projects last for many months and often years, most individuals gain hands-on experience on fewer than 10 major projects during her or his career. Although some gain experience on more projects, when the projects are short in duration or in part-time or consulting roles, few gain detailed experience on too many different types of projects. Learning from others is necessary in this field. In addition, the P/PM bodies of knowledge continue to grow and expand as new research is undertaken, new concepts are introduced, the significance of new factors is recognized, new conditions are experienced, new sets of stakeholders are encountered, new tools and technologies are developed, and other new factors come into play. For these and other reasons, continuous learning is absolutely necessary in the P/PM field. For some individuals and organizations, it will be critical, as competition for P/PM competence, performance and maturity increases on a global basis. For most of us, continuous learning is needed to learn, to recognize and use the best P/PM, to increase the probability of success on our programs and projects, and to advance in our careers. The PMWJ has therefore been launched to provide a global resource for continuous learning in the P/PM field. “Lessons learned” is a well established concept in the P/PM field. We should all document lessons learned, both positive and negative, during the close-out phases on our programs and projects. However, how many of those lessons learned find their way into the P/PM literature, professional bodies or communities of practice? Sharing knowledge and experiences with others, through publication or presentations, can ensure that those experiences and lessons are communicated to others who can benefit. PMWJ supports the sharing of P/PM knowledge with others. Our authors have agreed with this mission and offer their knowledge to our readers worldwide. Neither we nor our authors expect all readers to find everything important, useful or worthwhile. So review the contents and read what is useful or interesting to you. And if you have some knowledge or experience of your own to share, consider submitting an article or paper. Publication is easy; just contact editor@pmworldjournal.net. For information on publishing in the PMWJ, see Authors. Education, continuous learning and knowledge sharing are critical for advancing the development and application of professional P/PM around the world. The PMWJ is intended to support those processes, to advancing the P/PM profession worldwide, and to supporting the use of modern, professional P/PM for solving global problems. So much more can be accomplished through the application of competent, professional P/PM.